Turkey has long been a popular vacation and business travel destination for hundreds of thousands of Ukrainians, but few of these visitors can boast much knowledge of the Turkish politics. Now, however, as the anti-government protests and police brutality  in Turkey are making top headlines globally, many Ukrainians have started to follow the situation  there with much interest, expressing support and admiration for the peaceful protesters, noting similarities with the 2004 Orange Revolution  as well as with more recent events in Ukraine, and wishing for the political awakening of the Ukrainian people. The best news agency of the past few days is Osman Pashayev . It's good that Osman Pashayev  is in Istanbul – we have access to relevant information on the events there, without having to wait for international news [outlets to wake up] and for [Ukrainian news outlets] to copy – and, possibly, distort – [the reports of their international colleagues]. I've seen the crackdown on [left-wing activists] during the 2009 IMF summit in Istanbul, I've seen rallies of the opposition in Tbilisi [the capital of Georgia], a crackdown on the Arab protestors in Jerusalem, an anti-terrorist operation in northern Iraq, but I've never seen such a savage treatment of peaceful protesters before. 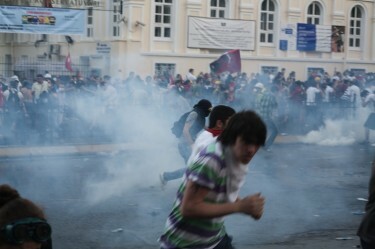 I cannot get to [Taksim Square ] – 100 meters, gas that [irritates] the eyes is everywhere. I bought two lemons and poured [juice] over myself and one Turkish girl. Eyes are itchy from lemon, but at least it makes breathing easier after a couple minutes. Many here are 18-25 years old. The police are waging a war against citizens. Our country – Ukraine – even under [the regime of President Viktor Yanukovych ] is almost an exemplary democracy. Today's Turkey resembles Russia a lot more, though not yet Belarus […]. First aid points to the injured on [Istiklal Avenue ]. Hotels are letting the protesters inside, shop owners are giving out water for free and administering first aid. Cab drivers are transporting those with serious injuries for free. It resembles the unity in Kyiv [during the 2004 Orange Revolution]. [Fans of football clubs Beşiktaş ], Fenerbahçe, Galatasaray. In the Ukrainian translation this will be “East and West together” [another popular slogan of the 2004 protests in Ukraine, referring to the political and cultural divide between eastern and western parts of Ukraine]. The most amusing pictures are of Fenerbahçe and Galatasaray holding hands. Hard for us to understand, but it's almost as if [Oleh Tyahnybok , the leader of the far-right Ukrainian VO Svoboda party ] showed up at a gay pride parade wearing [a Jewish kippah  cap]. Pashayev continues posting his update on Facebook and filing his stories on the protests in Turkey for Ukrainian TV channels. Another Ukrainian journalist, Mustafa Nayyem  [ru], has now joined him in Istanbul and is also posting reports, videos  and photos (here  and here ) on his Facebook page.